HIGH QUALITY WINDOWS AT GREAT PRICES" PLUS CUT YOUR ENERGY BILLS! Masterpiece Windows - J.D. Powers and Assoc. Rated our Window #1 in the Country! Masterpiece is a safe and reliable company with over 35 years in the window replacement industry and has had an A+ BBB rating since 1998. George Sullivan has been featured in multiple national magazines such as the Qualified Remodeler and the Remodeler Magazine and maintains a 100% customer satisfaction rating (CSI). The company has its corporate office in Cary, NC and is a member of the Cary Chamber of Commerce. Windows can give us a beautiful view to the world outside but when they also let in drafts and cold air we don’t always find our windows to be so beautiful. If this sounds like your windows maybe it’s time to call a qualified Window installation Company. Windows do age right along with the rest of a home and over time they become loose and inefficient at keeping out the elements. This is especially true of older style wood framed windows. The chalk can dry and fall out, leaving you to glaze window panes every few years. You may also find yourself putting up storm windows in the fall only to have to replace them with screens in the summer. Installing new windows is probably one of the easiest ways to improve the energy efficiency of your home and they look great too! New windows can instantly increase the value of your home by thousands; giving you an excellent return for your investment should you decide to sell. But window installation is not a do-it-yourself project for the average homeowner. 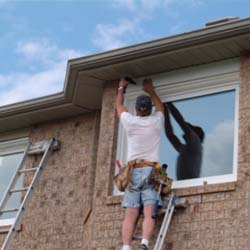 You need to contact a reliable Window installation Company to make certain the job is done right. If you’re considering a new window installation project you need to find a quality Window installation Company. The best method to find a reputable window installation company is by word of mouth. When a company has provided a quality service to the greater part of a community, word gets around. Ask your friends, family, coworkers and local business owners whether they have had a positive experience with any Window installation Company. Check your local yellow pages under “Windows”. Often you will find general contractors listed right along with window installation companies since installing windows is a big part of the home building and remodeling industry. Do a search on the internet. Online directories provide a database of businesses including window installation companies along with unbiased customer reviews and ratings. A larger Window installation Company may actually have its own website complete with window styles, before and after pictures and a contact page that you can fill out for a free no-obligation estimate. After you’ve found a few good prospects, talk with a representative of the Window installation Company. They will come to your home and do a walk-through with you to discuss all your options. The representative will explain the types of windows available such as double-hung, single-hung, fixed pane or casement windows. They can advise you on replacing a small window with a larger one or on the practicality of putting in that big bay window you’ve been dreaming about. Use this time to ask a few questions. You might not think it’s important to ask a well known Window installation Company questions about their licensing and insurance but a license or insurance policy can lapse and go unnoticed. Don’t feel embarrassed to ask! You don’t want to take this risk where your home and money are involved. Ask to see copies of current licensing and liability coverage and call to the contractor’s board of licensing and the insurance carrier to verify that they are up to date. Make certain that the Window installation Company also carries workers compensation to cover all its employees. If a worker is injured while working on your property and no workers comp is in place you could find yourself liable for some very big medical bills. Usually during this first visit the Window installation Company representative will write up a worksheet or estimate that includes the windows you’re interested in having installed as well as the per window price, cost of other materials such a The estimate will also include your payment options and available terms. You want to make certain a time frame is included as well, though most companies can install your windows in a day. This is where your previous research can come in handy. Maybe one window installation company comes highly recommended by a friend or neighbor while another you may know little about. Use your instincts but keep in mind that the best offer will come from a Window installation Company that not only suits your budget but provides quality service as well. Of course you’ll want to get everything in writing once you’ve made your final choice. No matter how well known a Window installation Company might be, you need to have a contract. This will spell out the details of your project and help prevent any problems from occurring in the future. A contract is simply a part of doing good business. Remember that your new windows are an investment in the future of your home. They will not only add beauty but value as well. If you decide to sell your home someday, new energy efficient windows are an attractive selling point and can greatly add to the selling price. But to achieve the desired effect you need to hire the right company for the project. The time you spend in searching for a reliable Window installation Company will prove to be time well spent.